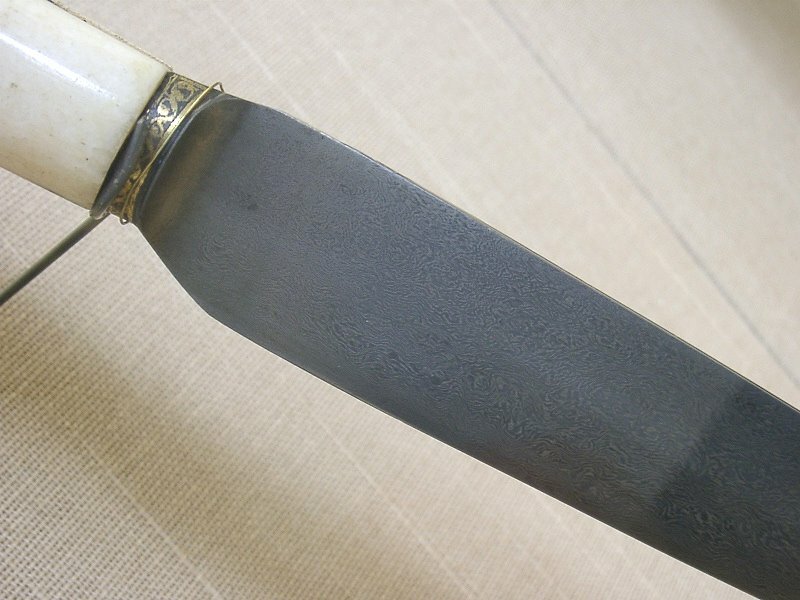 There are two main definitions for Damascus steel. 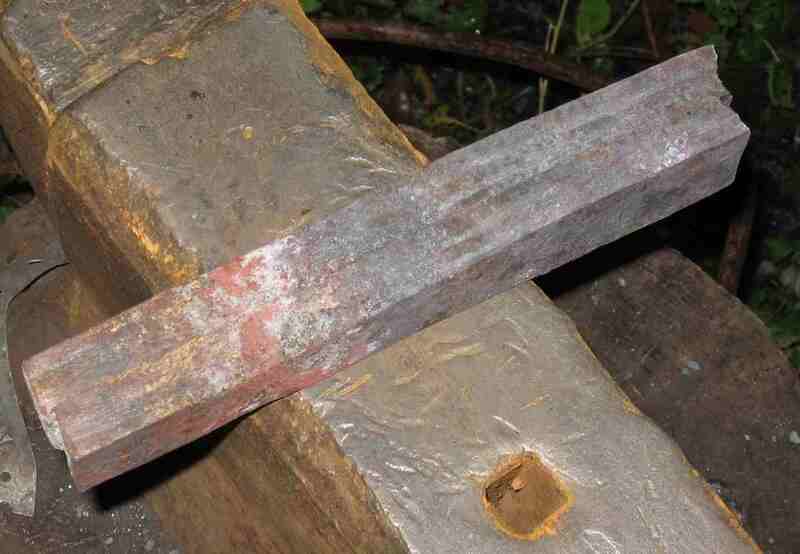 First are the original medieval wootz steels that some people think were first smelted in India and made into beautiful blades in the area presumed to be Damascus Syria. Its hard to know for sure about anything from that period in metal making history from so long ago, In part because of all the myth and mystery surrounding its origins. This page is general overview of making a blade. For details of specific blades, I have started building pages documenting the step by step construction of the making of various blades. I am currently working on a modern Katana. I currently am folding the layers of the billet, so there is not much to see at present. I will take photos where there is something worth seeing. I will add more blade pages as I get clients ording various styles. The forms I focus on are the modern styles of what we call pattern welded or Damascene steel. I will first show how I do a basic pattern welded billet, then later I will add a section for my version of the wootz making process. 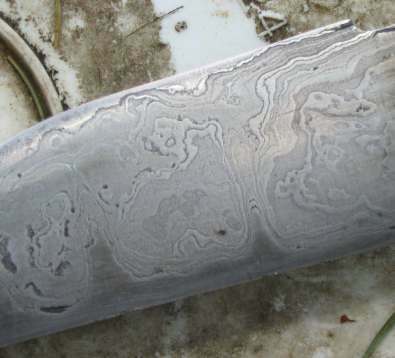 The finishing of the pattern welded blades are done the same way, it is in the making of the damascus billets, and the resulting patterns that it differs. People often ask where the patterns and colors come from. Understand that it is the steel itself that gives these wonderful patterns and colors. 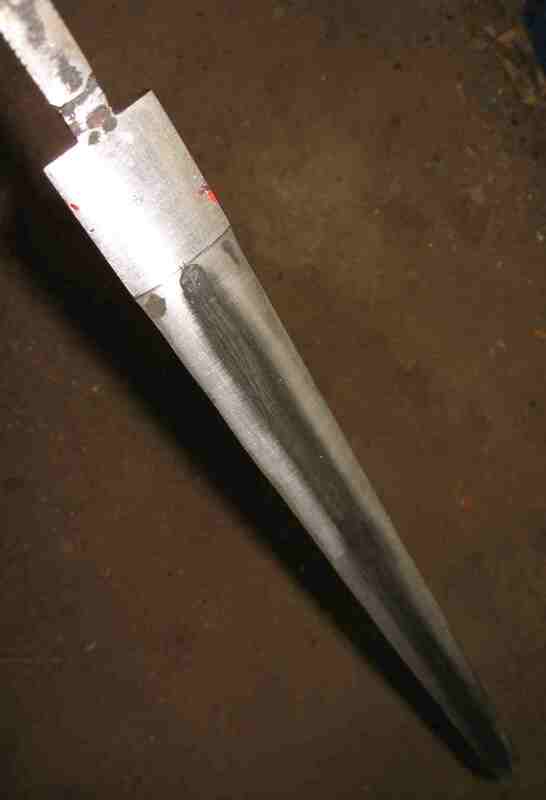 For a pattern welded blade we can use many metal combinations. Various added elements in the steels will cause the steels to etch differently. Manganese=black, Nickel=silver, Chromium=light gray, High carbon =dark gray and so forth. For planning the patterns of the billets, I generally place metals in groups of light and dark, though I have made blades of all light colored steels and it was a different look having the chrome and nickel alloys. With no dark banding it was more of a subtle sheen change: shiny vs. satin. For most blades I use 1095 as a dark layer. For the brighter layers L-6 is wonderful, as well as 15N20, which is close in make-up to L-6 but it has no chrome in its matrix. I have just begun to use meteorite iron. The small supply I have came from the 'Campo de Ciello' fall, containing about 6.3% nickel and like the A203E, will not harden on its own. But due to carbon migration in forging it collects enough that it is no problem with hardening a blade. 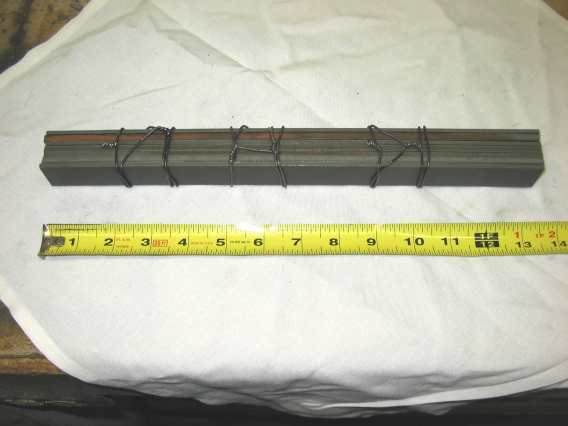 Usually I start with bars 12 to 18 inches long and 1 inch wide and thicknesses range from 1/32 to 1/4 inches thick depending on various factors. I grind the edges clean and free from mill scale, to improve the bond when welding, and then stack the steels alternating color type to about 1 1/4 inches tall. 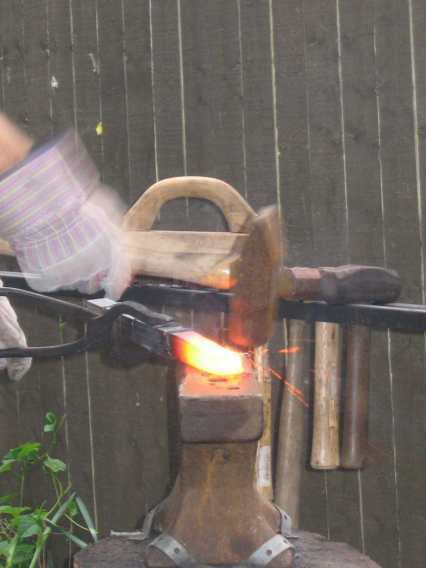 Much taller is too hard to hold an even heat when forging. As some layers will be cooler than others until welded. Non-nickel containing steels are placed to the outside of the stack to reduce scale formation. When making up a stack, I place them in the vice and squeeze the stack tight, and wrap it with wire in sections that I can remove as I weld. 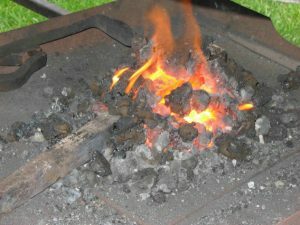 I mainly use a Coal forge and simple Borax (20 mule team, from the laundry dept.) as a flux when I do my pattern welding. Flux helps to keep out the air, which in turn helps to reduce scale. 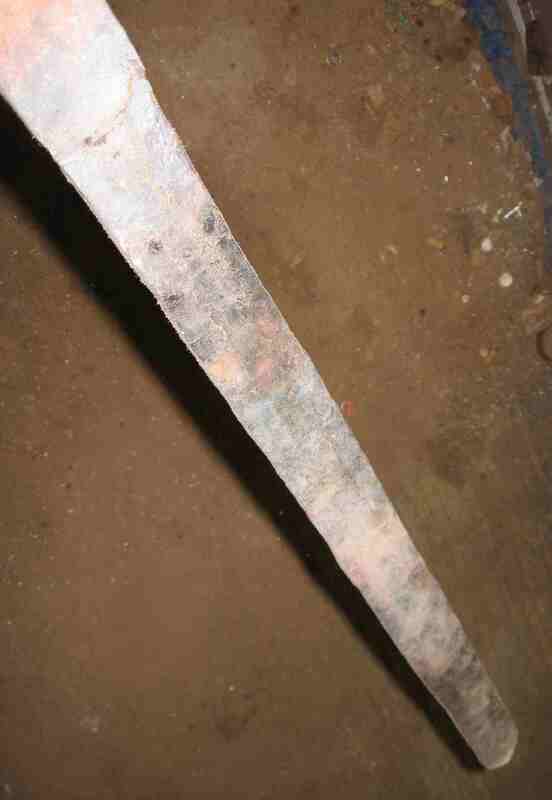 Since scale melts at much higher temperatures than the steel, it can interfere with the welds and it looks terrible. After fire welding and drawing out to length, I cut and re-stack and re-weld, repeating until the desired number of layers are produced. After I get the desired number of layers I could leave it as is: this is the standard random pattern that many produce. Or I can grind and/or twist the billet to produce various complex patterns, even adding this to other billets to make more complex patterns, like Lace, Chevrons, Serpent, Zebra and so on. After I hammer the blade to shape, I use a lighter hammer for the cutting edge, while this moves very little metal at a time, this cycling of the heating, cooling, and repeated hammering helps to refine the grain. This process is sometimes erroneously referred to as edge packing. After this I normalize to relax any stress introduced into the blade, then grind to the final dimensions. I make the handle and other hardware, and then heat treat the blade after everything is made to fit properly. I clean and polish to 600 grit and etch in a 1.5 % solution of ferric chloride, and then a second tempering cycle. Final polishing can be to 3000 grit or finer, but 1000 is average. For some patterns I will first etch in a solution of muratic acid to create a depth difference before I etch in the ferric, then its final assembly, polish and buff. Most of the fittings I make for the blades are made of nickel silver or brass; but some may be iron, mokume gane or even more Damascus. I offer the option of having the fittings plated in various metals such as sterling silver or gold, which I subcontract to a local plating Company. Whenever possible our leather, wood, bone, antler and gems for grips and inlays are purchased locally, and added as requested.